Hello everyone. I am sorry for the lack of content on here recently. I am working on a story from a recent ‘cycling’ trip in Mallorca. That should be published very soon. In the meantime, please go and have a look at my latest post on ‘up here for thinking (down there for running)’. This is a recipe for Tiffin – or chocolate fridge cake, I found the recipe on BBC Food website, and with todays announcement that BBC Food is going be axed, I thought I had better get it written down quickly! The ingredients are all highly fattening though and I’m afraid due to the biscuits, it is not gluten free either, however the recipe is very adaptable and some of the ingredients can be changed to suit taste. Use cling film to line a 20cm (8in) shallow, square-shaped tin. Leave extra cling film hanging over the sides. Put a sheet of greaseproof over the clingfilm to stop the mixture getting stuck to it. Melt chocolate, butter and golden syrup in a large heatproof bowl set over a pan of simmering water. Stir occasionally. Remove the bowl from the heat and stir in the broken biscuits, apricots (optional), raisins and pecans (optional). Spoon the mixture into the tin. Level the surface by pressing it down with a potato masher. Leave to cool, then put the chocolate mixture in the fridge for 1-2 hours to set. Marshmallows, Smarties, honeycomb and meringues all work well as alternative fillings – just chop them into small chunks and mix in with the melted chocolate mixture. In fact any kind of confectionery should work fine! I tripled (I think) the recipe and made 120 squares for the 100th parkrun at Chipping Sodbury. I doubled the recipe on the two occasions that I made them for the staffroom cake sale at son #3’s school. He is raising money for his World Challenge Expedition in 2017. I didn’t take this picture at the weekend – it was taken after the marathon in April 2015. 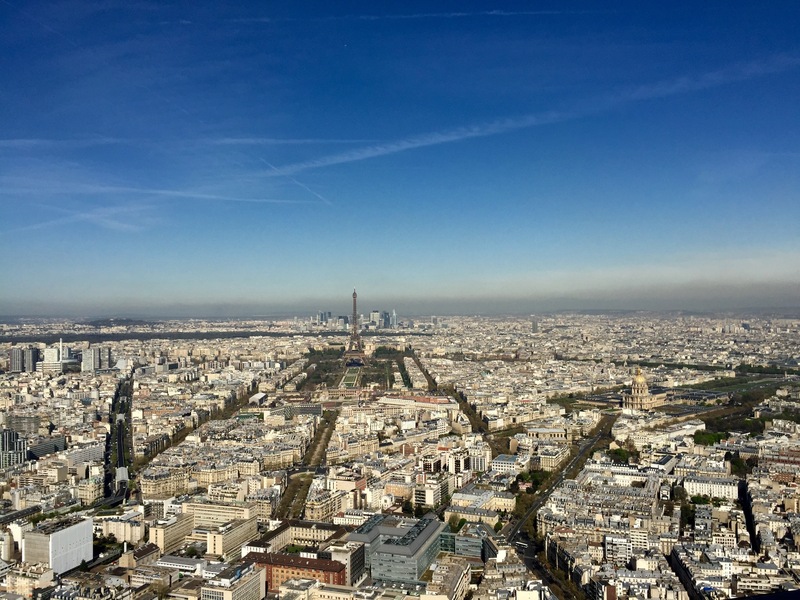 Paris is a great favourite of ours and we have visited 5 times in the past 4 years. I just felt it was appropriate to post a pic of this beautiful and complex city after the very sad events of Friday 13th November. 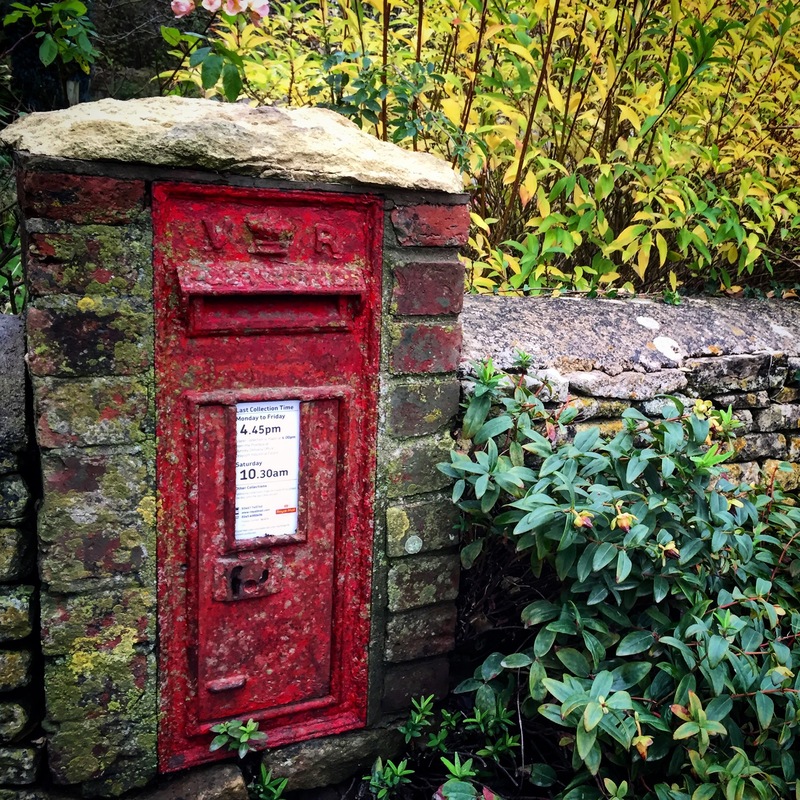 Victorian Post Box that I spotted on my run this morning. 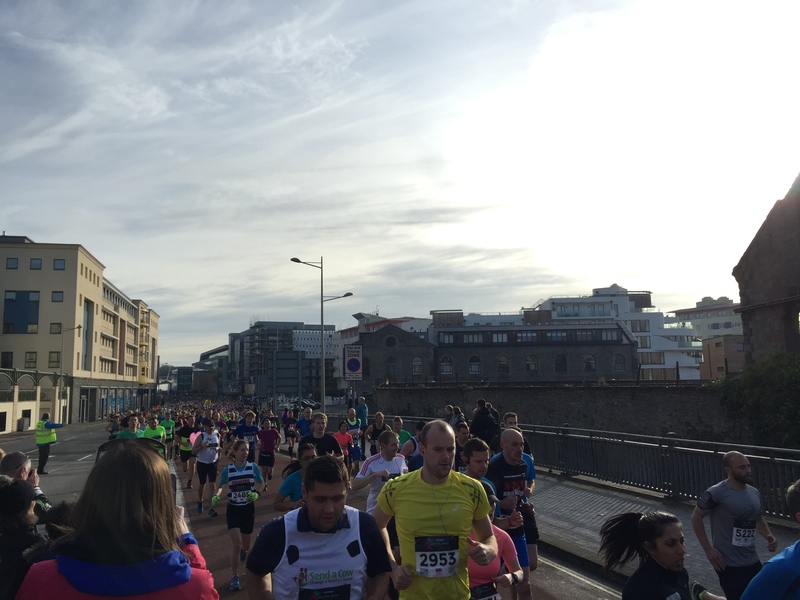 On Sunday it was the first ever Bristol + Bath Marathon. 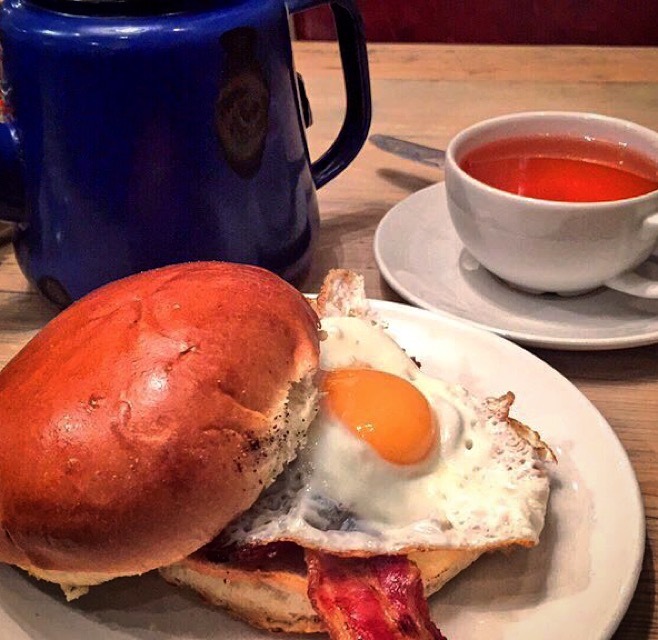 We’d had that extra hour in bed (sorry to anyone with small children!) but still had to leave home at 7.30am. This was Dave’s 5th marathon and his training had been brilliant (as usual) so he had no worries. Just a little apprehension about the course which looked pretty hilly on paper! No problems getting to the start near Queen’s Square in Bristol. The weather was pretty chilly at 5°C but the forecast was for a sunny day so starting in shorts was ok as it was going to warm up (easy for me to say – I had on 4 layers and a hat). Families and runners were milling about awaiting the start and there was a nice calm atmosphere. I had already decided that I would watch the start of the race and then drive across to Bath to see the finish. I said my goodbyes, relieved Dave of his last layer of warm clothing and made my way to the one mile mark where I met son#2 who had managed to drag himself from his bed to support dad. 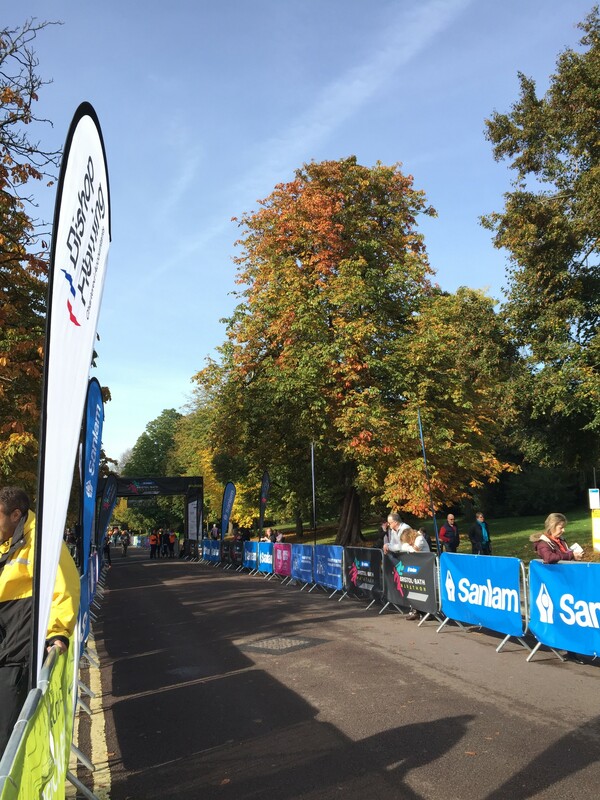 We clapped through all 6,500 runners and encouraged them with the knowledge that there were only 25.2 miles to go. 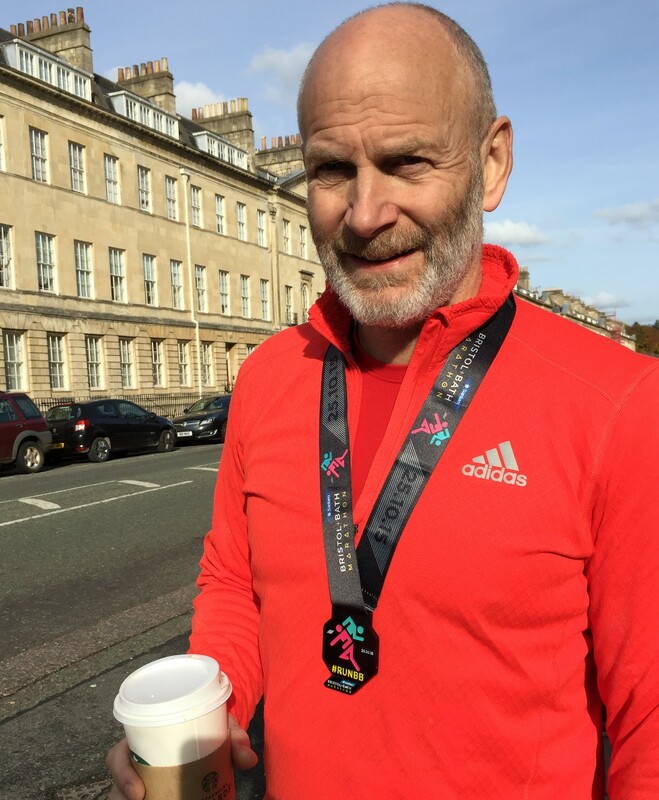 This is a very interesting marathon – apparently the only one in the UK to take in two cities. We could’ve watched the runners come past again just a little further up the road, but that would’ve meant waiting around for an hour or so and I wanted to pop across to Bath to see the leaders cross the finish line. Avoiding all the closed roads (I went via the M4,A46) I parked up at Lansdown Park and Ride and took the £2.60 return option into Bath city centre. It was nice that I didn’t have to rush so I could take in a few of the sights. Stewards and volunteers for the marathon were still preparing the road closures and getting set for the race to pass through. I settled myself at the final stretch – a fabulous setting just down the road from the Royal Crescent, and waited for first wave to arrive. The crowd were a nice mix of family and friends of runners and Bath locals who had just come out to get involved and have a cheer or wave a flag. The sun was shining and it really was quite pleasant. I imagine the scenario would not have been the same had the weather from Saturday (pouring rain) had continued into Sunday. The winner of the race arrived at 2 hours 31 minutes – that is amazing – and he didn’t even look like he had worked very hard – a natural runner obviously! My hands started to ache from clapping but I always try to clap as much as possible – these runners have earned a good round of applause. I was tracking Dave on Find Friends so I knew when he would be appearing onto the finishing stretch. He managed the race in 3 hours 49 mins and 10 secs – pretty brilliant if you ask me. After some recovery stretching and a quick hamstring massage courtesy of the missus we made our way back to the bus stop, continuing to clap and encourage the continuous flow of runners (or by this time for many, hobblers and limpers) on our way. Dave’s opinion was that the race was well organised and a good event (especially with the sun shining) but the course had quite a number of really brutal hills – which would not have been nice for any first timers, even fairly steep ascents in the last few hundred metres (now that’s really cruel) and this would put him off doing it in the future unless the organisers modified the route slightly. The park and ride bus back up to Lansdown seemed to take forever to come but on the plus side the driver was obviously in a celebratory mood as he did not charge the runners that were getting on – a nice gesture to recognise the effort and dedication of those who had run the 26.2 miles.